We’d love your help. Let us know what’s wrong with this preview of The Boy in the Black Suit by Jason Reynolds. Matt wears a black suit every day. No, not because his mom died—although she d Just when seventeen-year-old Matt thinks he can’t handle one more piece of terrible news, he meets a girl who’s dealt with a lot more—and who just might be able to clue him in on how to rise up when life keeps knocking him down—in this wry, gritty novel from the author of When I Was the Greatest. 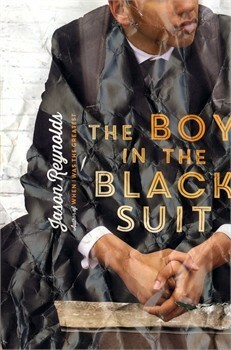 To ask other readers questions about The Boy in the Black Suit, please sign up. Is this book too mature for my 5th-6th graders? A quiet and beautiful story about a young man coming to terms with his mother's death and its aftermath. Jason Reynolds is a remarkable talent. Posted originally at my blog The Perpetual Page-Turner -- come hang out for book talk and more! 1. The Boy in the Black Suit was a book that I related to immensely: It’s no secret that I gravitate to books dealing with grief –especially that of a parent– and Jason Reynolds explored this with such finesse and beauty. Posted originally at my blog The Perpetual Page-Turner -- come hang out for book talk and more! 1. The Boy in the Black Suit was a book that I related to immensely: It’s no secret that I gravitate to books dealing with grief –especially that of a parent– and Jason Reynolds explored this with such finesse and beauty. Now, if you hear “grief” in the summary and normally go running, I’m begging you not to. It wasn’t the ugly sobbing sort of book about grief and it most definitely is NOT all about grief. Rather it was just so quietly profound and piercing in its emotion as Matt grieves his mom and tries to find normalcy in the after and tries to deal with that crushing loneliness that seems to separate you from everyone else because nobody seems to be able to truly understand — whether or not that’s true. I cannot even tell you how many pages I dog-eared because I just kept nodding my head like, “YES. Exactly this. I felt this.” I understood his need to watch someone else’s raw grief to know he wasn’t alone. I just connected with him so much and Jason Reynolds tapped into something REAL and raw that made my heart ache. 2. I loved the relationship between Matt & Lovey: I loved that Lovey doesn’t actually come into the picture right away because we really get to know Matt in a way I think we need to in order to show his loneliness but the downside to that is I WANTED MORE MATT AND LOVEY because they were just so smile inducing. Their connection is just so beautiful and honestly it reminds me a lot of how Will and I really connected for the first time in a real way. There’s something so isolating about grief and when you find someone who GETS it, it feels so intense. That’s how Will and I connected at first (I had just lost my mom and he had lost his mom when he was younger) and then it’s what brought us even closer together as a couple when he lost his dad a couple years into our relationship. What Matt and Lovey share is hard to describe but Jason Reynolds lets you FEEL it in such an honest way. 3. Matt’s POV is one of the best male POVs I’ve read in a while: Truly, his POV was just so refreshing and really captivated me. This book is definitely a character driven novel and Matt felt like a leap off the pages type character to me. God, Jason Reynolds is just a fantastic writer. "A lot of hard lives and young faces." This line pretty much sums up the lives of the characters and I loved watching Matt and Lovey grow from their tragedies. Check it out! I am having a renaissance. It’s cultural, personal and steeped in my own identity. I am reading writers of color and characters of color. This seems obvious. I’m black. I am of color. I am from the Bronx. I was born in the city and bred in the hood. Of course, I read books about people like me. Only, for most of my life I haven’t. In high school I was handed F. Scott Fitzgerald, S.E. Hinton and J.D. Salinger. I read and reread The Outsiders so many times, because somehow in my heart I connected with these white teens, who were poor, lived on the wrong side of town and buried friends. I got that. Because, I was poor, I lived on the wrong side of town and I buried friends. For the longest time, I thought that S.E. Hinton would be the closet I’d ever get to what my life was and has been. Then I met Adam Silvera, and Jason Reynolds and suddenly I was awake. Suddenly, in order to get characters of color I don’t have to read “urban” novels that I consumed like candy in my youth. It’s not all about The Coldest Winter Ever or Push. Now, I have More Happy Than Not, that is human story about kids who live in neighborhoods not too far from where I grew up, with a sci-fi edge. I can read When I Was The Greatest and get invited to the hottest house party in Brooklyn or I can go on the journey of lost, grief and acceptance with Matt in The Boy in The Black Suit. I love this book, because of its simple complexity. For years, with my love of werwolves and vampires and space ships, I forget that a story doesn’t need complex time travel loops in order to be good. A story can be about a young man who has to move on from the greatest loss of his life. Simple. And, yet emotionally compelling. Matt, with his simple and chill look at the world pulls you in. He’s the kid who lived next door from you, no matter where you grew up. He’s that kid, who is nice to his peers, respectful of his elders and trying to figure out who he is. He’s the kid who does not deserve the life that has suddenly been given to him. Which is what makes his journey so compelling. He doesn’t deserve it. How will he react when his life gets flip turned upside down? Something I love about Jason Reynolds is that he gives you the hood, and all of it’s truths without being over the top. Just because you live in Brooklyn doesn’t mean you’ve held a gun. Doesn’t mean you’re best friends with a drug dealer. It doesn’t mean that you have beef with rival gangs. Does that life exist outside the walls of your apartment or house? Yes. Does it have to be your truth? There’s this thing in literature and movies where if you come from a certain place your life has to be an NWA album. It doesn’t. That stuff can touch your life, but it doesn’t have to be your life. Jason Reynolds gives us truth. We know the world on the other side of the door, but we get the inside. The loving mother who taught you everything you need to know to survive. The best friend, who is loyal to you in the midst of everything. The girl, you meet by chance who makes your heart beat again after all the heartache. This book made me sad, it made me laugh, it showed me a world, a culture and a neighborhood so apart of me that I rarely get to see it in books, tv, or the movies. This book is so real and yet so entertaining and so thought provoking. Jason Reynolds doesn’t have to draw out in minute detail why Matt puts on his suit every day and goes to the funeral home. We get it. We feel it in the pages, we feel Matt’s emotions. His confusions, his heartache, and we feel it when his heart begins to mend, when he begins to heal, even though he will always have hole there that was his mother. I highly recommend this book and also everything by Jason Reynolds. Just too good to miss out on. The ONLY reason this realistic book that is by turns funny and heart-wrenching did not get 5 stars from me is the author's reliance on coincidence to stitch his story up at the end. Damn. This book. Just...damn. A beautifully written, quiet, character study of a young man who seeks solace after his mother's death by attending the funerals of others. Jason Reynolds is amazing. Read this book. I was a LITTLE disappointed in this one...mostly because of how much I loved Jason Reynolds' When I Was the Greatest. Like Ali, Matt is an African American teen in a rough neighborhood who does his best to make good choices, but this narrative just doesn't have the same punch that Ali's did. There's not as much character interaction--much of the narrative is just Matt's internal thoughts--and the most interesting interactions are those he has with Lovey, who doesn't appear until halfway through I was a LITTLE disappointed in this one...mostly because of how much I loved Jason Reynolds' When I Was the Greatest. Like Ali, Matt is an African American teen in a rough neighborhood who does his best to make good choices, but this narrative just doesn't have the same punch that Ali's did. There's not as much character interaction--much of the narrative is just Matt's internal thoughts--and the most interesting interactions are those he has with Lovey, who doesn't appear until halfway through the book. More to come. It was refreshing to read a story like this from a black teen boy's point of view. All hail, Jason Reynolds! The man can write no wrong. I loved this book. It's a perfect mixture of grief and hope and humor. Reynolds writes in a way that is gut-wrenching, yet beautiful. Go read everything with his name on it. No really, go right now! I liked the narrative voice and I liked the protagonist, but I set it down about halfway through. I think it was lacking the spark I was looking for, in the dialogue and in emotion. I'd try another book by this author down the road, though. This was a good book. I don't think I would go any higher to say I think is an amazing book but it certainly deserves good. This book took me a long time to finish and I think that is partly because I have nothing to relate to the main character. I am a white male living with my family in rural Maine. He is a black male living alone in urban Brooklyn, New York. I can walk down the street with not a thought about getting shot, he, however, its always a possibility. This book was about a black te This was a good book. I don't think I would go any higher to say I think is an amazing book but it certainly deserves good. This book took me a long time to finish and I think that is partly because I have nothing to relate to the main character. I am a white male living with my family in rural Maine. He is a black male living alone in urban Brooklyn, New York. I can walk down the street with not a thought about getting shot, he, however, its always a possibility. I was not impressed with this one. In fact, I was bored. The book drags on and the reader waits and waits for some big event...but nothing happens. I was really hoping for a book that teenagers who have suffered loss could really connect to, but I don't believe this is it! I know teenagers pretty well, and it's doubtful they would wade through this book. reynolds, and i'm looking forward to reading more!! i love his narrative voice! How I struggled to finish this! It kind of always felt like nothing was really happening. Would not recommend. I now really want to test out the chocolate chip cookie recipe Reynolds included in this book. Loved this. Jason Reynolds is definitely becoming one of my favourite authors. One day, while working another funeral, Matt meets Lovey. A girl with a strange name, but who appears mature and compos Matthew Miller is still reeling from the loss of his mother, but now he must deal with his father who is drinking to numb his feelings. To help pay the bills, Matt has been given a job by Mr. Willie Ray, a friend of the family's, at his funeral home. Matt finds working there and attending these strangers' funerals oddly comforting as he continues to navigate his own grief alone. Even with my dissatisfaction about the way The Boy in the Black Suit ends, Jason Reynolds has quickly become a must-read, no-questions-asked author for me. That has been even further reinforced by his poem-a-day in April on his blog. His poetry is so profound despite its few words. But I already knew that based on the amazing book he co-authored with his friend Jason Griffin called My Name is Jason. Mine Too. Our Story. Our Way, an under-the-radar book that will undoubtedly be getting more attention now that Jason's star is on the rise. I've already got his 2016 novel, Long Way Down, on my Goodreads TBR list despite very little information about it. I am looking forward to reading ALL THE BOOKS from Jason Reynolds. I don't doubt he will have a long and storied career. The Boy in the Black Suit by Jason Reynolds came out the first week of the year. I heard good things from several people, and was eager to try on of Reynold's books. Boy was I not disappointed. Matt Miller is a boy who wears a black suit to school every day. His mom died of cancer recently, but that's not the reason for the suit. Matt, a senior on an abbreviated schedule due to good grades, works every day at a local funeral home. He arran Originally posted here at Random Musings of a Bibliophile. Matt Miller is a boy who wears a black suit to school every day. His mom died of cancer recently, but that's not the reason for the suit. Matt, a senior on an abbreviated schedule due to good grades, works every day at a local funeral home. He arranges flowers, sets up buffets, washes cars, and sometimes acts as pall bearer. He also attends most of the funerals. Sitting in the back, he soaks up every ounce of heart splitting grief he can. Matt has close friends, both old and new, who are there for him though and don't allow him to get swallowed up in his own grief. Friends who will have his back, broaden his horizons, and bring him back, little by little, into the world of the living. Matt's world shrunk considerably when his mom died. He lost his position at the bank he was supposed to be working at for school. His father started drinking again after years of sobriety. He lost almost all the joy in his life. Matt loves to cook but finds he can't because it reminds him too much of his mom. In the days closest to her death, you can see that he is only hanging on by the barest of threads. As the days and weeks pass, it gets a little easier. His method of coping is a bit odd. He goes to the funerals and focuses on the person who appears closest to the deceased, and then eagerly awaits for the breakdown of grief he knows is coming. Like living vicariously through these grieving people keeps his own close enough that he never forgets what he's lost. Then his father ends up in the hospital and he's living alone. I felt so bad for Matt and worried for him. But I like his progression away from his grief too. He slowly begins to live a little. He hangs out with his best friend, who works hard to keep things as normal as possible between them. Matt's new boss becomes his mentor, sharing the hard times of his own life and giving Matt advice. Then there is Love, a girl Matt meets who brightens his world. She expands it too, dragging Matt into places he's never been and sharing her own pains. Through his relationships with the people around him, Matt takes his steps back into his full self, slightly altered but with a sense of purpose and reason to keep living. 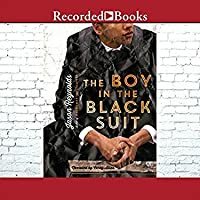 The relationships and community are central aspect of The Boy in the Black Suit, and I found them all equally real, important, and necessary. This book showcases how the people in a person's life can make all the difference in times of crisis. I enjoyed all of the interactions between Matt and the other characters from the playful typical teenage banter he shares with Chris to the deep philosophical discussions with Mr. Ray to the tentatively healing superficial conversations with his dad to the gamut of conversations he has with Love, all of them are important and fit the characters and setting. The setting of Bed-Stuy is fully realized as well, showcasing a community of diverse people with different motivations, pasts, potential futures, problems, jobs, and lifestyles. I really felt like I was experiencing the streets, restaurants, noises, and hilariously frightening cab drives right along with Matt. The Boy in the Black Suit is an excellent look at the process of grief and the importance of community. Matthew Miller’s mother has died, and his father has quickly become a basket case. After 20 years of sobriety thanks to Matt’s mom, his father’s drinking again. Seventeen-year-old Matt needs to find part-time work after school to help pay the bills. He’s very much on his own. Trying to heal from his loss and loneliness, Matt begins paying attention to the funerals at work. He watches other bereaved people deal with their pain and tries to understand how he might get past his own. Matt wears his work clothes--his black suit--to school, which is why the book is called THE BOY IN THE BLACK SUIT. Meanwhile, Love is a young woman whom Matt’s seen working at Cluck Bucket. They have their first real meeting at Matt’s workplace, crossing paths at Love’s grandmother’s funeral. Love, an orphan, has been living with her grandmother. Now she, too, is very much on her own. I’ve read many contemporary young adult novels that feature an exceptionally quirky teen character finding someone to hang with, or two exceptionally quirky teen characters finding one other. In contrast, Matt and Love are both young everyday people, decent teens stuck in tough positions in a tough neighborhood. Finding one another is a salvation. There is authenticity to these characters, the Bedford-Stuyvesant setting, and the tragedies in their lives and their neighborhood. It’s easy to connect with Matt and Love. Mr. Ray, the funeral home owner, is a complex adult character. He’d once been a promising athlete, but his career ended before it started because of a terrible injury. He becomes a friend and positive father figure to Matt while also working out his own issues. Well-crafted and thoughtful, THE BOY IN THE BLACK SUIT shows how a pair of young people can come to care about and help each other in a rough and often unforgiving world. I hadn't heard anything about this book before it showed up at my house one day. It sounded interesting (and you know how I love books about grief) and so I planned to slip it very high up the TBR pile. I mention that so you know that this book quickly became an anticipated read of mine and also to let you know that this book completely caught me off guard. Like Matt, I lost a parent in high school and I absolutely agree with him that at that age, your grief isolates you. You don't know anyone el I hadn't heard anything about this book before it showed up at my house one day. It sounded interesting (and you know how I love books about grief) and so I planned to slip it very high up the TBR pile. I mention that so you know that this book quickly became an anticipated read of mine and also to let you know that this book completely caught me off guard. Like Matt, I lost a parent in high school and I absolutely agree with him that at that age, your grief isolates you. You don't know anyone else who's lost a parent (and there's no guarantee that they've even lost a grandparent). I didn't start crashing funerals but I can absolutely get the idea that you see people who are experiencing the same loss you've had and it...well, it doesn't really help but it does make you feel less alone. I love the characters in this book---Matt and his best friend Chris and his boss Mr. Ray but especially Lovey. Lovey is wonderful and I hope there's a sequel. 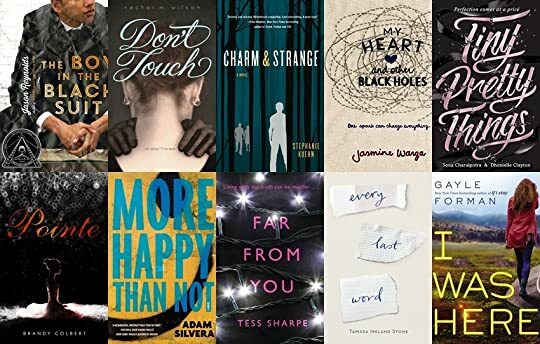 The Boy in the Black Suit is included in Hollywood News Source's 10 YA Books To Read For Mental Health Awareness Month. I love the authentic voice of the main character, though perhaps the ingenious and unique portrayal of grief struck me the most. It's extremely heartfelt. Important messages on life and love, woven into a story about pain and loss. The Boy in the Black Suit is a permission slip to grieve. Click here to watch a video review of this book on my book channel, From Beginning to Bookend. The audio was too slow so I finished by reading the rest of the physical book. This isn't a flashy, exciting novel by any means, but it's a great look at the different ways people grieve and move past grief. A poignant, realistic, affecting story with some nice doses of humor.